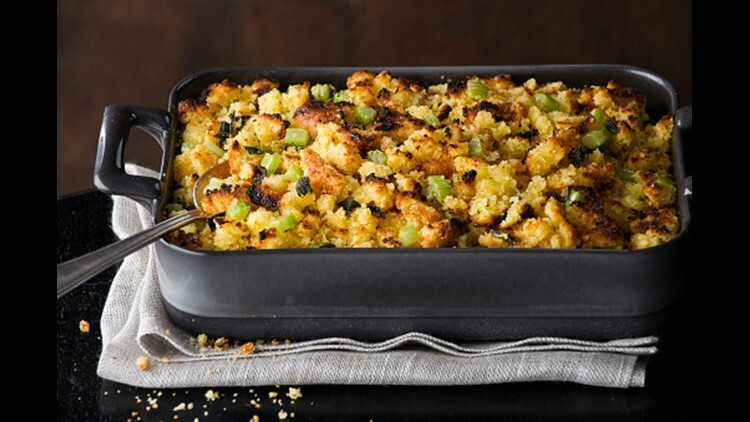 Thanksgiving can be tough on those who don't enjoy or eat meats, but we've found the best vegan stuffing recipe that the whole family (meat-eaters alike!) will enjoy. The night before, cube your bread and set it in a large bowl to dry out - you want it to be the texture of day old bread - noticeably dry but not rock hard. The day of, if you haven’t already cooked your lentils, do so now by thoroughly rinsing 3/4 cup lentils in cold water, then adding to a small saucepan with 1 1/2 cups veggie broth or water. Preheat oven to 350 degrees F (176 C) and line a 9x13 pan (or comparable sized dish) with foil or spray with nonstick spray. Also prepare flax egg and set aside. Sauté onion and celery in the olive oil or vegan butter and season with a bit of salt and pepper. Cook until fragrant and translucent - about 5 minutes. Set aside. To the bowl of bread, pour most of the broth then add the remaining ingredients (sage, cooked veggies, flax egg, and lentils) and mix with a wooden spoon. The key is to make sure it is about the consistency of a meatloaf. If it’s too dry, add more broth and mix again. If it’s gotten too wet, add more bread. Transfer to the prepared pan and cover with foil. Bake for 45 minutes. Then remove the top layer of foil so the top can brown. Increase heat to 400 degrees F (204 C) and bake for another 10-15 minutes or until the top is well browned and crisp. Remove from oven and let cool slightly before serving. Leftovers reheat well in the microwave or oven, though best when fresh. Thanks to The Minimalist Baker for the recipe!